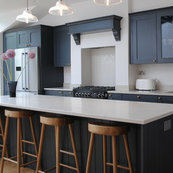 Our Eclectic kitchen was designed and fitted six years ago and it looks as good today as when it was installed. We really love our new kitchen. The project ran smoothly and to time and the team was very accommodating to fit around our needs when we were in the house. This is the second time we have usedEclectic.